New Delhi : An expected comment by a professor at Jadavpur University (JU) in Kolkata has triggered outrages in the nation. 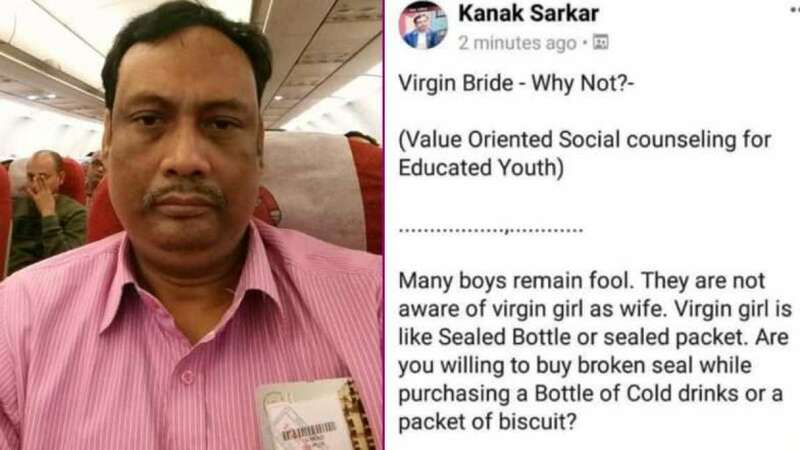 In the Facebook post, the professor has compared “virgin girl” to “sealed bottle or sealed packet” and his statement has invited criticism from various sectors. Kanak Sarkar, who has been teaching international relations in JU, India's premier institutions for the past two decades said that he had mentioned his personal opinion. He, however, deleted the post immediately after the uproar. The professor post also said many boys remain fool. They are not aware of virgin girl as wife”, on Monday morning after it went viral but wrote in another post a few hours later that he was free to express his opinion. The post created agitation among students and teachers. They alleged that Sarkar had been writing objectionable posts and making similar remarks on campus for a long time. It is known to all that Jadavpur University has been a hotbed of student politics and witnessed long agitation on various issues. “Supreme Court has repealed Section 66A of Information Technology Act and given freedom of expression in social media,” Sarkar wrote in the second post, inviting another barrage of scathing criticism from students, teachers and a section of intellectuals across Bengal. “A woman can lose virginity for various reasons, during sporting activities for example. This professor’s educational background is questionable. What will he teach to students?” said Saswati Ghosh, head of economics department at City College. “It’s everybody’s right to express his/her thoughts. I have given many posts for and in favour of women. Can verify them in my Timeline,” he added and even drew references to writer Taslima Nasreen and poet Srijato who drew criticism for their writings in the past. “People chose to ignore him all these years but now he has crossed the limit. We must do something. Teachers are also agitated,” she added. The girls of JU took strong action against Sarkar’s posts. “Women are not edible, immovable objects which are meant to be consumed like a packet of biscuits. Neither are their intellect determined by the ‘seal’ on them,” said Raima Ganguly, a post-graduate student of comparative literature. Last week, JU authorities asked a teacher to vacate his quarters in compound within 15 days for allegedly thrashing his mother and throwing her out on a wintry night in December last year. Samir Das, an assistant professor of history, was also issued a show cause notice on January 4 and asked to respond within 15 days. Meanwhile, students of Jadavpur University in Kolkata stage protest in campus demanding expulsion of Prof Kanak Sarkar over his remarks made in a Facebook post, say, "We want his expulsion as he is influencing young minds &we don't want misogynistic environment here. He's a repeat offender."